American air-launched orbital launch vehicle. 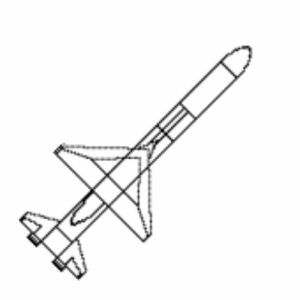 Privately-funded, air-launched winged light satellite launcher. Status: Active. First Launch: 1990-04-05. Last Launch: 1994-08-03. Number: 4 . Payload: 375 kg (826 lb). Thrust: 486.64 kN (109,401 lbf). Gross mass: 19,000 kg (41,000 lb). Height: 15.50 m (50.80 ft). Diameter: 1.27 m (4.16 ft). Apogee: 200 km (120 mi). 4 stage vehicle consisting of 1 x NB-52 + 1 x Orion 50S + 1 x Orion 50 + 1 x Orion 38. LEO Payload: 375 kg (826 lb) to a 200 km orbit. Development Cost $: 55.000 million. Launch Price $: 11.000 million in 1994 dollars. Stage 0. 1 x L-1011. Gross Mass: 156,000 kg (343,000 lb). Empty Mass: 109,629 kg (241,690 lb). Thrust (vac): 561.900 kN (126,320 lbf). Isp: 9,900 sec. Burn time: 4,590 sec. Isp(sl): 9,000 sec. Diameter: 16.86 m (55.31 ft). Span: 47.00 m (154.00 ft). Length: 54.00 m (177.00 ft). Propellants: Air/Kerosene. No Engines: 3. Engine: RB-211-22B. Status: In Production. Comments: Lockheed airliner swept wing. Release conditions: Belly-mounted, 36,800 kg, 17.1 m length x 7.9 m span at 925 kph at 11,890 m altitude. Stage 1. 1 x Pegasus-1. Gross Mass: 14,020 kg (30,900 lb). Empty Mass: 1,868 kg (4,118 lb). Thrust (vac): 484.909 kN (109,012 lbf). Isp: 294 sec. Burn time: 72 sec. Isp(sl): 180 sec. Diameter: 1.27 m (4.16 ft). Span: 6.71 m (22.01 ft). Length: 8.88 m (29.13 ft). Propellants: Solid. No Engines: 1. Engine: Pegasus-1. Status: In Production. Stage 2. 1 x Pegasus-2. Gross Mass: 3,370 kg (7,420 lb). Empty Mass: 345 kg (760 lb). Thrust (vac): 118.199 kN (26,572 lbf). Isp: 292 sec. Burn time: 73 sec. Isp(sl): 240 sec. Diameter: 1.27 m (4.16 ft). Span: 1.27 m (4.16 ft). Length: 2.65 m (8.69 ft). Propellants: Solid. No Engines: 1. Engine: Pegasus-2. Status: In Production. Stage 3. 1 x Pegasus-3. Gross Mass: 985 kg (2,171 lb). Empty Mass: 203 kg (447 lb). Thrust (vac): 34.568 kN (7,771 lbf). Isp: 293 sec. Burn time: 65 sec. Isp(sl): 240 sec. Diameter: 0.97 m (3.18 ft). Span: 0.97 m (3.18 ft). Length: 2.08 m (6.82 ft). Propellants: Solid. No Engines: 1. Engine: Pegasus-3. Status: In Production. Stage 4. 1 x Pegasus-4. Gross Mass: 90 kg (198 lb). Empty Mass: 17 kg (37 lb). Thrust (vac): 666 N (149 lbf). Isp: 236 sec. Burn time: 241 sec. Diameter: 0.97 m (3.18 ft). Span: 0.97 m (3.18 ft). Length: 0.25 m (0.82 ft). Propellants: Hydrazine. No Engines: 3. Engine: MR-107. Status: In Production. GBI American anti-ballistic missile. Suborbital booster for the US Missile Defense Agency's Ground-based Midcourse Defense system's EKV ballistic missile kill vehicle. The basic OBV consisted of the upper three stages and guidance system from the Taurus orbital launch vehicle (essentially a wingless Pegasus-XL). The OBV was launched from an open pad; the operational version was to be silo-launched. HXLV Variant of Pegasus air-dropped launch vehicle for suborbital tests of the X-43 scramjet test vehicle. Pegasus XL American air-launched orbital launch vehicle. Uprated version of Pegasus air-launched winged light satellite launcher. 4 stage vehicle consisting of 1 x L-1011 + 1 x Pegasus XL stage 1 + 1 x Orion 50XL + 1 x Orion 38. Family: aircraft-launched, orbital launch vehicle. Country: USA. Engines: MR-107, RB-211-22B. Spacecraft: GLOMR, Pegsat, REX, Microsat, Orbcomm, MSTI, CDS, SCD, ALEXIS, Eagle, APEX, Microstar, STEP, TOMS-EP, FAST, HETE, SAC-B, CPAC, Minisat, Orbview-2, FORTE, SNOE, Teledesic, TRACE, SWAS, WIRE, TERRIERS, SA-200, Orbview, HESSI, SORCE, Galex, SCISAT, DART, ST5, RS-300, C/NOFS, IRIS Interface Region Imaging Spectrograph. Launch Sites: Point Arguello WADZ, Mayport DZ. Stages: NB-52, Pegasus-1, Pegasus-2, Pegasus-3. Agency: OSC. Bibliography: 2, 276, 279, 42, 455, 5, 552, 554, 6, 61, 8478, 12945. USA 55 - . Payload: GLOMR 2 / TERCEL / SECS. Mass: 25 kg (55 lb). Nation: USA. Agency: DARPA. Class: Communications. Type: Military communications satellite. Spacecraft: GLOMR. USAF Sat Cat: 20547 . COSPAR: 1990-028B. Apogee: 642 km (398 mi). Perigee: 477 km (296 mi). Inclination: 94.10 deg. Period: 95.90 min. Store and forward. Air dropped in Point Arguello WADZ..
1991 July 17 - . 17:33 GMT - . Launch Site: Point Arguello. Launch Complex: Point Arguello WADZ. Launch Pad: Aircraft from Edwards.. Launch Platform: NB-52 008. LV Family: Pegasus. Launch Vehicle: Pegasus/HAPS. Failed Stage: G.
Microsat 1 - . Payload: Microsat 1 / ... / Microsat 7. Mass: 22 kg (48 lb). Nation: USA. Agency: DARPA. Class: Technology. Type: Communications technology satellite. Spacecraft: Microsat. Decay Date: 1992-01-23 . USAF Sat Cat: 21580 . COSPAR: 1991-051A. Apogee: 454 km (282 mi). Perigee: 356 km (221 mi). Inclination: 82.00 deg. Period: 92.70 min. Test of LEO network for global communications. Air dropped in Point Arguello WADZ..
Microsat 2 - . Mass: 22 kg (48 lb). Nation: USA. Agency: DARPA. Class: Technology. Type: Communications technology satellite. Spacecraft: Microsat. Decay Date: 1992-01-23 . USAF Sat Cat: 21581 . COSPAR: 1991-051B. Apogee: 454 km (282 mi). Perigee: 355 km (220 mi). Inclination: 82.00 deg. Period: 92.70 min. Test of LEO network for global communications. Air dropped in Point Arguello WADZ..
Microsat 3 - . Mass: 22 kg (48 lb). Nation: USA. Agency: DARPA. Class: Technology. Type: Communications technology satellite. Spacecraft: Microsat. Decay Date: 1992-01-24 . USAF Sat Cat: 21582 . COSPAR: 1991-051C. Apogee: 454 km (282 mi). Perigee: 355 km (220 mi). Inclination: 82.00 deg. Period: 92.70 min. Test of LEO network for global communications. Air dropped in Point Arguello WADZ..
Microsat 4 - . Mass: 22 kg (48 lb). Nation: USA. Agency: DARPA. Class: Technology. Type: Communications technology satellite. Spacecraft: Microsat. Decay Date: 1992-01-23 . USAF Sat Cat: 21583 . COSPAR: 1991-051D. Apogee: 454 km (282 mi). Perigee: 355 km (220 mi). Inclination: 82.00 deg. Period: 92.70 min. Test of LEO network for global communications. Air dropped in Point Arguello WADZ..
Microsat 5 - . Mass: 22 kg (48 lb). Nation: USA. Agency: DARPA. Class: Technology. Type: Communications technology satellite. Spacecraft: Microsat. Decay Date: 1992-01-24 . USAF Sat Cat: 21584 . COSPAR: 1991-051E. Apogee: 455 km (282 mi). Perigee: 355 km (220 mi). Inclination: 82.00 deg. Period: 92.70 min. Test of LEO network for global communications. Air dropped in Point Arguello WADZ..
Microsat 6 - . Mass: 22 kg (48 lb). Nation: USA. Agency: DARPA. Class: Technology. Type: Communications technology satellite. Spacecraft: Microsat. Decay Date: 1992-01-25 . USAF Sat Cat: 21585 . COSPAR: 1991-051F. Apogee: 454 km (282 mi). Perigee: 355 km (220 mi). Inclination: 82.00 deg. Period: 92.70 min. Test of LEO network for global communications. Air dropped in Point Arguello WADZ..
Microsat 7 - . Mass: 22 kg (48 lb). Nation: USA. Agency: DARPA. Class: Technology. Type: Communications technology satellite. Spacecraft: Microsat. Decay Date: 1992-01-23 . USAF Sat Cat: 21586 . COSPAR: 1991-051G. Apogee: 452 km (280 mi). Perigee: 358 km (222 mi). Inclination: 82.00 deg. Period: 92.70 min. Test of LEO network for global communications. Air dropped in Point Arguello WADZ..
SCD-1 - . Payload: SCD 1 / Orbcomm CDS. Mass: 115 kg (253 lb). Nation: Brazil. Agency: INPE. Class: Communications. Type: Civilian communications satellite. Spacecraft: SCD. USAF Sat Cat: 22490 . COSPAR: 1993-009B. Apogee: 793 km (492 mi). Perigee: 729 km (452 mi). Inclination: 25.00 deg. Period: 100.10 min. Environmental data relay. The SCD-1 (Data Collection Satellite 1) was a Brazilian satellite designed for the collection of meteorological data relayed by data collection platforms spread throughout the Brazilian territory. Air dropped in Mayport DZ..
Alexis - . Payload: Alexis (P 89-1B). Mass: 115 kg (253 lb). Nation: USA. Agency: USAF STP. Class: Astronomy. Type: X-ray astronomy satellite. Spacecraft: Alexis. USAF Sat Cat: 22638 . COSPAR: 1993-026A. Apogee: 746 km (463 mi). Perigee: 741 km (460 mi). Inclination: 69.80 deg. Period: 99.70 min. Test of X-ray imaging sensors; solar array deployment malfunction. Spacecraft engaged in research and exploration of the upper atmosphere or outer space (US Cat B). Air dropped in Point Arguello WADZ..
1994 August 3 - . 14:38 GMT - . Launch Site: Point Arguello. Launch Complex: Point Arguello WADZ. Launch Pad: Aircraft from Edwards.. Launch Platform: NB-52 008. Launch Vehicle: Pegasus. P90-6 APEX - . Payload: APEX/Orion 38. Mass: 260 kg (570 lb). Nation: USA. Agency: USAF STP. Class: Technology. Type: Navigation technology satellite. Spacecraft Bus: PegaStar. Spacecraft: APEX. USAF Sat Cat: 23191 . COSPAR: 1994-046A. Apogee: 2,534 km (1,574 mi). Perigee: 360 km (220 mi). Inclination: 69.98 deg. Period: 114.82 min. Advanced Photovoltaic and Electronic Experiments; studied radiation and plasma effects on solar power systems. Air dropped in Point Arguello WADZ..
Orbview-1 - . Payload: Microlab 1. Mass: 74 kg (163 lb). Nation: USA. Agency: Orbimage. Program: Orbview. Class: Earth. Type: Atmosphere satellite. Spacecraft: Microstar. USAF Sat Cat: 23547 . COSPAR: 1995-017C. Apogee: 747 km (464 mi). Perigee: 733 km (455 mi). Inclination: 70.00 deg. Period: 99.60 min. Lightning mapper; GPS radio occultation. Air dropped in Point Arguello WADZ..
1996 March 9 - . 01:53 GMT - . Launch Site: Point Arguello. Launch Complex: Point Arguello WADZ. Launch Pad: Aircraft from Vandenberg.. Launch Platform: L-1011. LV Family: Pegasus. Launch Vehicle: Pegasus XL. REX-II - . Mass: 85 kg (187 lb). Nation: USA. Agency: USAF STP. Class: Earth. Type: Ionosphere satellite. Spacecraft Bus: GemStar. Spacecraft: REX. USAF Sat Cat: 23814 . COSPAR: 1996-014A. Apogee: 835 km (518 mi). Perigee: 799 km (496 mi). Inclination: 90.00 deg. Period: 101.20 min. LEO Air dropped in Point Arguello WADZ..
1996 May 17 - . 02:44 GMT - . Launch Site: Point Arguello. Launch Complex: Point Arguello WADZ. Launch Pad: Aircraft from Vandenberg.. Launch Platform: L-1011. LV Family: Pegasus. Launch Vehicle: Pegasus H.
MSTI-3 - . Payload: MSTI 3. Mass: 170 kg (370 lb). Nation: USA. Agency: BMDO. Class: Military. Type: Strategic defense satellite. Spacecraft Bus: SA-200. Spacecraft: MSTI. Decay Date: 1997-12-11 . USAF Sat Cat: 23868 . COSPAR: 1996-031A. Apogee: 432 km (268 mi). Perigee: 420 km (260 mi). Inclination: 97.10 deg. Period: 90.70 min. LEO. Sensor technology tests Air dropped in Point Arguello WADZ..
1996 July 2 - . 07:48 GMT - . Launch Site: Point Arguello. Launch Complex: Point Arguello WADZ. Launch Pad: Aircraft from Vandenberg.. Launch Platform: L-1011. LV Family: Pegasus. Launch Vehicle: Pegasus XL. TOMS-EP - . Mass: 248 kg (546 lb). Nation: USA. Agency: NASA Greenbelt. Class: Earth. Type: Atmosphere satellite. Spacecraft Bus: T100. Spacecraft: TOMS-EP. USAF Sat Cat: 23940 . COSPAR: 1996-037A. Apogee: 746 km (463 mi). Perigee: 705 km (438 mi). Inclination: 98.30 deg. Period: 99.30 min. LEO. Total Ozone Mapping Spectrometer-Earth Probe; atmospheric ozone mapping. Air dropped in Point Arguello WADZ..
SAC-B - . Nation: Argentina. Agency: CONAE. Program: SAC. Class: Technology. Type: Navigation technology satellite. Spacecraft: SAC-B. Decay Date: 2002-04-07 . USAF Sat Cat: 24645 . COSPAR: 1996-061A. Apogee: 555 km (344 mi). Perigee: 487 km (302 mi). Inclination: 38.00 deg. Period: 95.00 min. Air dropped in Wallops Island DZ..
Teledesic 1 - . Payload: BATSAT. Nation: USA. Agency: Teledesic. Manufacturer: Germantown. Class: Communications. Type: Civilian communications satellite. Spacecraft: Teledesic. Decay Date: 2000-10-09 . USAF Sat Cat: 25234 . COSPAR: 1998-012B. Apogee: 577 km (358 mi). Perigee: 532 km (330 mi). Inclination: 97.70 deg. Period: 95.70 min. Communications Technology Demonstrator. Air dropped in Point Arguello WADZ..
1998 April 2 - . 02:42 GMT - . Launch Site: Point Arguello. Launch Complex: Point Arguello WADZ. Launch Pad: Aircraft from Vandenberg.. Launch Platform: L-1011. LV Family: Pegasus. Launch Vehicle: Pegasus XL. TRACE - . Nation: USA. Agency: NASA Greenbelt. Program: Small Explorer. Class: Astronomy. Type: Solar satellite. Spacecraft: TRACE. USAF Sat Cat: 25280 . COSPAR: 1998-020A. Apogee: 652 km (405 mi). Perigee: 602 km (374 mi). Inclination: 97.80 deg. Period: 97.10 min. NASA's third Small Explorer, the Transition Region and Coronal Explorer (TRACE), was successfully launched by an Orbital Pegasus XL. The L-1011 carrier aircraft took off from Vandenberg and dropped the Pegasus over the Pacific Ocean. TRACE, a project led by Lockheed's solar physics group, carried a 30-cm extreme ultraviolet imaging telescope which will study the Sun. The telescope mirrors were made by the Smithsonian Astrophysical Observatory. TRACE had an 8.5 arcmin field of view and 1 arcsecond resolution. Air dropped in Point Arguello WADZ. 1998 October 23 - . 00:02 GMT - . Launch Site: Cape Canaveral. Launch Complex: Mayport DZ. Launch Pad: 29.0 N x 78.3 W. Launch Platform: L-1011. LV Family: Pegasus. Launch Vehicle: Pegasus H.
SCD-2 - . Mass: 110 kg (240 lb). Nation: Brazil. Agency: McLean. Manufacturer: INPE. Class: Communications. Type: Civilian communications satellite. Spacecraft: SCD. USAF Sat Cat: 25504 . COSPAR: 1998-060A. Apogee: 760 km (470 mi). Perigee: 736 km (457 mi). Inclination: 25.00 deg. Period: 99.80 min. Brazil's SCD-2 satellite was aboard Orbital Science's L-1011 Stargazer aircraft when it took off from the Cape Canaveral Air Station's Skid Strip (Runway 02/20, 28.2N 80.6W) at 23:05 GMT on Oct 22 and flew to the drop zone near Cape Canaveral (in the Mayport, Florida, Warning Area) at 29.0N 78.3W. The Pegasus ignited 5 seconds after drop. The first stage carried a NASA experiment attached to its right wing, to study hypersonic boundary layer separation. The 115 kg Satelite de Coleta de Dados (Data Collection Satellite) relays data from environmental monitoring stations. Air dropped in Mayport DZ. 1998 December 6 - . 00:57 GMT - . Launch Site: Point Arguello. Launch Complex: Point Arguello WADZ. Launch Pad: Aircraft from Vandenberg.. Launch Platform: L-1011. LV Family: Pegasus. Launch Vehicle: Pegasus XL. SWAS - . Nation: USA. Agency: NASA Greenbelt. Program: Small Explorer. Class: Astronomy. Type: X-ray astronomy satellite. Spacecraft: SWAS. USAF Sat Cat: 25560 . COSPAR: 1998-071A. Apogee: 611 km (379 mi). Perigee: 599 km (372 mi). Inclination: 69.90 deg. Period: 96.80 min. On December 3 the Orbital Sciences L-1011 Stargazer took off from Vandenberg AFB Runway 30/12 carrying a Pegasus XL launch vehicle with the SWAS satellite aboard. It reached the drop box at 36.0N 123.0W over the Pacific, but due to a software-related problem the range ordered the launch scrubbed and the L-1011 returned to base. After a further delay due to weather, the L-1011 took off at 23:58 GMT on December 5 and SWAS reached orbit and separated from the third stage at 01:09 GMT. SWAS, the Sub-millimetre Wave Astronomy Satellite, had a 0.6m telescope with a 490 to 550 GHz sub-millimetre receiver and an acousto-optical spectrometer. SWAS was used to study the cooling of molecular cloud cores, the sites of star formation in our galaxy, by measuring lines from molecular oxygen and water. Air dropped in Point Arguello WADZ. 1999 March 5 - . 02:56 GMT - . Launch Site: Point Arguello. Launch Complex: Point Arguello WADZ. Launch Pad: Aircraft from Vandenberg.. Launch Platform: L-1011. LV Family: Pegasus. Launch Vehicle: Pegasus XL. WIRE - . Nation: USA. Agency: NASA Greenbelt. Class: Astronomy. Type: X-ray astronomy satellite. Spacecraft: WIRE. Decay Date: 2011-05-10 . USAF Sat Cat: 25646 . COSPAR: 1999-011A. Apogee: 582 km (361 mi). Perigee: 537 km (333 mi). Inclination: 97.50 deg. NASA's long-delayed WIRE (Wide Field Infrared Explorer) astronomy satellite was the fifth Small Explorer (SMEX) mission managed by NASA-Goddard. The L-1011 Stargazer launch aircraft took off from Vandenberg's runway 30/12 at 01:55 GMT on March 2 for the first launch attempt. The planned 02:56 GMT launch was cancelled at T-46 seconds due to a problem with the tail fin release mechanism of the Pegasus XL launch vehicle. The second attempt was successful, with the Pegaus XL being dropped at 36 degrees N x 123 degrees W over the Pacific Ocean at 02:56 GMT. However the WIRE ran into serious trouble shortly after orbit injection. The cover of the solid hydrogen telescope ejected prematurely, and the cryogenic coolant evaporated and vented, spinning the satellite out of control. WIRE was going to make an infrared photometry survey, generating a large catalog of galaxies and quasars. Air dropped in Point Arguello WADZ. 2000 October 9 - . 05:38 GMT - . Launch Site: Kwajalein. Launch Complex: Kwajalein DZ. Launch Pad: RW06/24. Launch Platform: L-1011. LV Family: Pegasus. Launch Vehicle: Pegasus H.
HETE-2 - . Mass: 130 kg (280 lb). Nation: USA. Agency: NASA Greenbelt. Manufacturer: MIT. Class: Astronomy. Type: X-ray astronomy satellite. Spacecraft: HETE. USAF Sat Cat: 26561 . COSPAR: 2000-061A. Apogee: 641 km (399 mi). Perigee: 598 km (372 mi). Inclination: 1.95 deg. Period: 97.02 min. First orbital launch from Kwajalein. Second High Energy Transient Explorer; built by MIT using leftover parts from the first HETE. This failed to operate because of a Pegasus adapter failure during launch in November 1996. MIT operates the satellite, while the program is managed by NASA GSFC as an Explorer mission of opportunity. HETE's main instrument is FREGATE, the French Gamma Telescope, a hard X-ray spectrometer operating in the 6 to 400 keV energy range. This gamma ray burst detector, together with a Wide Field X-ray Monitor hard X-ray coded mask telescope, is used to trigger searches with the two Soft X-ray Imagers which have 33-arcsecond spatial resolution. This will let astronomers get precise locations for gamma-ray bursts, allowing detailed follow-up with optical instruments. The satellite is in a 595 x 636 km x 2.0 deg equatorial orbit, and sends data to a network of small ground terminals spaced around the equator. Air dropped in Kwajalein DZ. 2001 June 2 - . 20:43 GMT - . Launch Site: Point Arguello. Launch Complex: Point Arguello WADZ. Launch Pad: Aircraft from Edwards.. Launch Platform: NB-52 008. LV Family: Pegasus. Launch Vehicle: Hyper X. FAILURE: Failure. Failed Stage: 1. X-43A test - . Nation: USA. Agency: OSC. Apogee: 7.00 km (4.30 mi). Hypersonic scramjet vehicle test. The X-43A/Pegasus booster combination was air-launched at 7600 m altitude. However the booster disintegrated at Max-Q. The redesign of the launch profile and modifications to the booster would take NASA almost three years. Air dropped in Point Arguello WADZ. 2002 February 5 - . 20:58 GMT - . Launch Site: Cape Canaveral. Launch Complex: Mayport DZ. Launch Pad: 29.0 N x 78.5 W. Launch Platform: L-1011. LV Family: Pegasus. Launch Vehicle: Pegasus XL. HESSI - . Payload: SA-200S. Mass: 449 kg (989 lb). Nation: USA. Agency: NASA. Manufacturer: Gilbert. Class: Astronomy. Type: Solar satellite. Spacecraft Bus: SA-200. Spacecraft: HESSI. USAF Sat Cat: 27370 . COSPAR: 2002-004A. Apogee: 599 km (372 mi). Perigee: 574 km (356 mi). Inclination: 38.00 deg. Period: 96.40 min. HESSI, the sixth Small Explorer, carried a rotating modulation collimator transform telescope, imaging solar flares in the hard X-ray spectrum. The launch marked the return to flight of Pegasus after the Hyper-X failure. The launch was originally to have occurred on 28 March 2001. The L-1011 launch aircraft took off at 19:29 GMT from the Cape Canaveral Skid Strip RW30/12, and headed out to the drop area at 28.0 N 78.5 W over the Atlantic. Drop of the Pegasus in the Atlantic Drop Zone at 28.0 N 78.5 W was at 20:58 GMT, with ignition 5 seconds later. The Pegasus reached orbit at 21:07 GMT. On the first pass it was confirmed that the solar panels had opened. The satellite rotated at 15 rpm, imaging by reconstructing the Fourier components from the time modulation of the solar x-ray flux through a set of 9 grids each 9 cm in diameter. It was expected to make images with a resolution of 2 arcseconds at 40 keV energies and 36 arcseconds at 1 MeV energies. The launch delays meant that HESSI missed some of the best flares at solar max. Air dropped in Mayport DZ. 2003 February 6 - . 21:00 GMT - . Launch Site: Vandenberg. Launch Complex: Vandenberg 576E. LV Family: Pegasus. Launch Vehicle: GBI. BV-6 Boost Vehicle Test Flight - . Nation: USA. Agency: USAF AFSPC. Manufacturer: OSC. Apogee: 1,810 km (1,120 mi). Successful first launch of the prototype of the three-stage version of the Taurus launch vehicle being developed by Orbital Sciences for Boeing for use in the Ground-based Midcourse Defense (GMD) system. The vehicle launched the dummy payload on a trajectory over the Pacific Ocean, reaching an altitude of 2100 km and traveling 6500 km down range. 2003 April 28 - . 12:00 GMT - . Launch Site: Cape Canaveral. Launch Complex: Mayport DZ. Launch Pad: 29.0 N x 78.5 W. Launch Platform: L-1011. LV Family: Pegasus. Launch Vehicle: Pegasus XL. Galex - . Mass: 280 kg (610 lb). Nation: USA. Agency: NASA. Manufacturer: OSC. Class: Astronomy. Type: Ultraviolet astronomy satellite. Spacecraft Bus: LEOStar-2. Spacecraft: Galex. Duration: 3,710.00 days. USAF Sat Cat: 27783 . COSPAR: 2003-017A. Apogee: 699 km (434 mi). Perigee: 694 km (431 mi). Inclination: 29.00 deg. Period: 98.70 min. Ultraviolet space telescope. Much delayed launch (from January 19, May 19, July 16, 21 and 30, August 14 and October 17, 2002; January 27, March 25 and 30, April 15 and 26 2003). It was finally switched off on 28 June 2013, following an extra tenth year of observing funded by Caltech. Air dropped in Mayport DZ. 2003 June 26 - . 18:55 GMT - . Launch Site: Point Arguello. Launch Complex: Point Arguello WADZ. Launch Pad: Aircraft from Vandenberg.. Launch Platform: L-1011. LV Family: Pegasus. Launch Vehicle: Pegasus XL. Orbview 3 - . Mass: 304 kg (670 lb). Nation: USA. Agency: McLean. Program: Orbview. Class: Earth. Type: Earth resources satellite. Spacecraft Bus: LEOStar. Spacecraft: Orbview. Decay Date: 2011-03-13 . USAF Sat Cat: 27838 . COSPAR: 2003-030A. Apogee: 455 km (282 mi). Perigee: 452 km (280 mi). Inclination: 97.30 deg. Period: 93.70 min. One-meter-resolution commercial imaging satellite. Orbview-3 used an Orbital Leostar bus and had a launch mass of 304 kg (including ca. 50 kg of hydrazine for orbit raising and the 66 kg science instrument). Launch had been delayed from September 2002, April 30, May 9 and 23 Air dropped in Point Arguello WADZ. 2003 August 16 - . 18:00 GMT - . Launch Site: Vandenberg. Launch Complex: Vandenberg LF23. Launch Pad: LF23?. LV Family: Pegasus. Launch Vehicle: GBI. BV-6 Missile Defense Interceptor Booster test. - . Nation: USA. Agency: USAF AFSPC. Manufacturer: OSC. Apogee: 1,874 km (1,164 mi). The Orbital Sciences Corperation booster was successfully tested with a mock EKV after a one-day launch delay. Shock and vibration environments were measured and compared to previous test levels. Preliminary analyses suggest that the new booster produced lower than expected vibrations at the EKV. 2004 January 27 - . 02:23 GMT - . Launch Site: Kwajalein. Launch Complex: Kwajalein Meck. LV Family: Pegasus. Launch Vehicle: GBI. IFT-13B [EKV Mock-up] test - . Nation: USA. Agency: OSC. Manufacturer: OSC. Apogee: 272 km (169 mi). Launch delayed from October 2003. This system-level test of the Orbital Sciences' boost vehicle launched the rocket carrying a simulated EKV from Kwajalein Atoll against a simulated target coming from Vandenberg AFB, Calif. IFT-13B was not an intercept attempt. Included in this test was the latest version of the GMD program's fire control software, which was being built by Northrop Grumman and which performed as expected in this test. 2004 March 27 - . 21:59 GMT - . Launch Site: Point Arguello. Launch Complex: Point Arguello WADZ. Launch Pad: Aircraft from Edwards.. Launch Platform: NB-52 008. LV Family: Pegasus. Launch Vehicle: Hyper X.
X-43A-2 (Hyper X) - . Nation: USA. Agency: OSC. Apogee: 29 km (18 mi). The second X-43 launch incorporated modifications to the first flight vehicle, including an upgraded control system, redesigned autopilot, off-loaded rocket motor, and improved analytical models. The second flight was launched at 12,200 m instead of the 7600 m altitude of the failed first launch to reduce transonic aerodynamic loads and improve structural and control system margins. An offloaded Orion 50S solid rocket motor reduced maximum dynamic pressure during the flight. Air dropped in Point Arguello WADZ. 2004 November 16 - . 22:35 GMT - . Launch Site: Point Arguello. Launch Complex: Point Arguello WADZ. Launch Pad: Aircraft from Edwards.. Launch Platform: NB-52 008. LV Family: Pegasus. Launch Vehicle: Hyper X.
X-43A test - . Nation: USA. Agency: OSC. Apogee: 33 km (20 mi). Delayed from September, November 9 and 15. Final test of NASA's X-43A-3 Hyper X hypersonic scramjet demonstrated air-frame integrated scramjet performance at speeds approaching Mach 10. Changes to the launch vehicle compared to Flight 2 included high-temperature thermal protection system tiles on the wing and fin leading edge, elimination of all ballast, a full propellant load on the ATK Orion 50S booster, lightweight aluminum structures, and updated control laws and aerodynamics. Air dropped in Point Arguello WADZ. 2004 December 10 - . Launch Site: Vandenberg. Launch Complex: Vandenberg. LV Family: Pegasus. Launch Vehicle: GBI. GBI Deployment at Vandenberg - . Nation: USA. Agency: MDA. Manufacturer: OSC. The first of two operational anti-ballistic missiles to be deployed during 2005 at Vandenberg AFB was lowered into its underground silo. This marked the first installation in the continental United States..
2004 December 15 - . 06:01 GMT - . Launch Site: Kwajalein. Launch Complex: Kwajalein. LV Family: Pegasus. Launch Vehicle: GBI. FAILURE: Launch abort; anti-ballistic missile never left silo..
IFT-13C Launch Abort - . Mass: 55 kg (121 lb). Nation: USA. Agency: MDA. Manufacturer: OSC. Launch abort - booster shut down in silo. Missile target, launched from Alaska, impacted in Pacific Ocean. Delayed from January, August, November, December 9 and 12. The failed attempt was later said to be due to a very minor software glitch which created a gap in the flow of electronic messages between the flight computer and the interceptor's thrust vector controller. Five flight tests of the system were scheduled for 2005, including at least two attempted intercepts. The IFT-13c test was expected to be repeated as early as mid-February. IFT-14 was planned for March or April. 2005 February 17 - . Launch Site: Kwajalein. Launch Complex: Kwajalein. LV Family: Pegasus. Launch Vehicle: GBI. FAILURE: Launch abort - booster shut down in silo..
IFT-14 launch attempt. - . Mass: 55 kg (121 lb). Nation: USA. Agency: MDA. Manufacturer: OSC. Delayed from October 2004. Missile Defense Technology / EKV Prototype planned intercept attempt. The interceptor failed to leave the silo. As in IFT-13C, Orbital Sciences' booster, carrying Raytheon's production kill vehicle, was supposed to fly from Kwajalein and hit a target coming out of Kodiak, Alaska. The system shut itself down just a few seconds before launch. Arms that held the interceptor in the silo did not fully retract, and the launch software aborted the mission. MDA failure analysis resulted in a redesign of the launch mechanism and improved quality control. 2005 December 14 - . 03:04 GMT - . Launch Site: Kwajalein. Launch Complex: Kwajalein Meck. LV Family: Pegasus. Launch Vehicle: GBI. FT-1 EKV Prototype ABM test - . Nation: USA. Agency: MDA. Manufacturer: OSC. Apogee: 1,800 km (1,100 mi). Launch delayed from late 2004. Successful test of hit-to-kill anti-ballistic missile homer, although no target was intercepted..
2006 September 1 - . 17:39 GMT - . Launch Site: Vandenberg. Launch Complex: Vandenberg LF23. Launch Pad: LF23?. LV Family: Pegasus. Launch Vehicle: GBI. FT-2 - . Nation: USA. Agency: MDA. Manufacturer: OSC. Apogee: 1,000 km (600 mi). 2007 April 25 - . 20:26 GMT - . Launch Site: Point Arguello. Launch Complex: Point Arguello WADZ. Launch Pad: Aircraft from Vandenberg.. Launch Platform: L-1011. LV Family: Pegasus. Launch Vehicle: Pegasus XL. AIM - . Mass: 150 kg (330 lb). Nation: USA. Agency: Hampton, NASA. Manufacturer: Ball, OSC. Spacecraft: RS-300. USAF Sat Cat: 31304 . COSPAR: 2007-015A. Apogee: 602 km (374 mi). Perigee: 584 km (362 mi). Inclination: 97.80 deg. Period: 96.50 min. NASA Small Explorer mission, for Aeronomy of Ice in the Mesosphere. AIM carried three scientific instruments to study polar mesospheric clouds: a solar occultation camera, an ultraviolet imager, and a cosmic dust experiment. Air dropped in Point Arguello WADZ. 2007 September 28 - . 20:16 GMT - . Launch Site: Vandenberg. Launch Complex: Vandenberg LF23. Launch Pad: LF23?. LV Family: Pegasus. Launch Vehicle: GBI. FTG-03a - . Nation: USA. Agency: MDA. Manufacturer: OSC. Apogee: 1,000 km (600 mi). 2008 April 16 - . 17:02 GMT - . Launch Site: Kwajalein. Launch Pad: RW06/24. Launch Platform: L-1011. LV Family: Pegasus. Launch Vehicle: Pegasus XL. C/NOFS - . Mass: 395 kg (870 lb). Nation: USA. Agency: McLean. Class: Earth. Type: Seismology satellite. Spacecraft: C/NOFS. Decay Date: 2015-11-28 . USAF Sat Cat: 32765 . COSPAR: 2008-017A. Apogee: 852 km (529 mi). Perigee: 405 km (251 mi). Inclination: 13.00 deg. Period: 97.30 min. The C/NOFS (Communication/Navigation Outage Forecasting System) satellite flew the US Defence Department's Space Test Program P00-3 space weather forecasting mission. The L-1011 launch aircraft staged from Kwajalein atoll to a release point for the Pegasus booster somewhere over the Pacific at 10.5229 N 167.7562 E. The research satellite carring ionospheric instruments, including Aerospace Corporation's CORISS receiver which used GPS signals to determine electron densities in the ionosphere, and the Naval Research Laboratory's CERTO ionospheric radio beacon. The spacecraft was built by General Dynamics C4 Systems (former Spectrum Astro) and was managed by DoD-STP and the Air Force Research Lab. The objective was to provide data that would allow better forecasts of ionospheric scintillation which causes problems with communications and GPS signals. The satellite deployed six 10-meter booms after release from the final booster stage. Air dropped in Kwajalein Drop Zone. 2008 August 22 - . 09:10 GMT - . Launch Site: Wallops Island. Launch Complex: Wallops Island LA0B. LV Family: Pegasus. Launch Vehicle: ALV. FAILURE: Went off course and destroyed by range safety 27 seconds after launch..
HyBolt/SOAREX-VI - . Nation: USA. Agency: Clemson. Class: Technology. Apogee: 3.50 km (2.10 mi). Carried HyBOLT and SOAREX-VI hypersonic research experiments..
2008 October 19 - . 17:47 GMT - . Launch Site: Kwajalein. Launch Complex: Kwajalein DZ. Launch Pad: RW06/24. Launch Platform: L-1011. LV Family: Pegasus. Launch Vehicle: Pegasus XL. IBEX - . Mass: 107 kg (235 lb). Nation: USA. Agency: NASA. Manufacturer: OSC. Class: Astronomy. Type: X-ray astronomy satellite. Spacecraft: Microstar. USAF Sat Cat: 33401 . COSPAR: 2008-051A. Apogee: 281,252 km (174,761 mi). Perigee: 69,563 km (43,224 mi). Inclination: 19.23 deg. Period: 12,855.81 min. Interstellar Boundary Explorer. Mission was to map, from its high earth orbit, the boundary of the heliosphere, the point at the limits of the solar system where the solar wind is overcome by the interstellar medium. Air dropped in Kwajalein DZ..
2008 December 5 - . 20:21 GMT - . Launch Site: Vandenberg. LV Family: Pegasus. Launch Vehicle: GBI. MDA FTG-05 - . Nation: USA. Agency: MDA. Manufacturer: OSC. Class: Military. Type: ABM. 2010 January 31 - . 23:45 GMT - . Launch Site: Vandenberg. LV Family: Pegasus. Launch Vehicle: GBI. FTG-06 EKV - . Nation: USA. Agency: MDA. Manufacturer: OSC. Type: ABM. Apogee: 1,000 km (600 mi). Interceptor. 2010 June 6 - . 22:25 GMT - . Launch Site: Vandenberg. LV Family: Pegasus. Launch Vehicle: GBI. BVT-1 - . Nation: USA. Agency: MDA. Manufacturer: OSC. Type: ABM. Apogee: 300 km (180 mi). Test launch. 2010 December 15 - . 20:03 GMT - . Launch Site: Vandenberg. Launch Complex: Vandenberg LF23. Launch Pad: LF23?. LV Family: Pegasus. Launch Vehicle: GBI. GMD FTG-06a - . Nation: USA. Agency: MDA. Manufacturer: OSC. Type: ABM. Apogee: 1,000 km (600 mi). FTG-06A KV - . Nation: USA. Agency: MDA. Manufacturer: OSC. Type: ABM. Apogee: 1,000 km (600 mi). ABM test..
2012 June 13 - . 16:00 GMT - . Launch Site: Kwajalein. Launch Complex: Kwajalein DZ. Launch Pad: RW06/24. Launch Platform: L-1011. LV Family: Pegasus. Launch Vehicle: Pegasus XL. Nustar - . Payload: Leostar. Mass: 360 kg (790 lb). Nation: USA. Class: Astronomy. Type: X-ray astronomy satellite. Spacecraft: SA-200. USAF Sat Cat: 38358 . COSPAR: 2012-031A. Apogee: 632 km (392 mi). Perigee: 614 km (381 mi). Inclination: 6.00 deg. Period: 97.20 min. Hard X-ray observatory with ten-meter mast. Air dropped in Kwajalein Drop Zone..
2013 January 26 - . 22:00 GMT - . Launch Site: Vandenberg. Launch Complex: Vandenberg LF23. LV Family: Pegasus. Launch Vehicle: GBI. EKV CTV-01 - . Nation: USA. Agency: MDA. Manufacturer: OSC. Type: ABM. Apogee: 1,000 km (600 mi). ABM test of CE-II EKV kill vehicle..
2013 July 5 - . 18:35 GMT - . Launch Site: Vandenberg. LV Family: Pegasus. Launch Vehicle: GBI. FTG-07 CE-I EKV - . Nation: USA. Agency: MDA. Manufacturer: OSC. Type: ABM. Apogee: 1,000 km (600 mi). Anti-ballistic missile. Failure; did not intercept target vehicle..
2014 June 22 - . 18:55 GMT - . Launch Site: Vandenberg. Launch Complex: Vandenberg LF23. Launch Pad: LF23?. LV Family: Pegasus. Launch Vehicle: GBI. GMD FTG-06b CE-II EKV - . Nation: USA. Agency: MDA. Manufacturer: OSC. Type: ABM. Apogee: 1,000 km (600 mi). 2016 January 28 - . 21:57 GMT - . Launch Site: Vandenberg. LV Family: Pegasus. Launch Vehicle: GBI. CE-II CTV-02+ - . Nation: USA. Type: ABM. Apogee: 1,000 km (600 mi). ABM Interceptor mission. Impacted in E Pacific..
2016 December 15 - . 13:37 GMT - . Launch Site: Cape Canaveral. Launch Complex: Cape Canaveral RW31/13. LV Family: Pegasus. Launch Vehicle: Pegasus XL. CYGNSS A - . Payload: CYGFM01. Mass: 18 kg (39 lb). Nation: USA. Class: Earth. Type: Weather satellite. Spacecraft: CYGNSS. USAF Sat Cat: 41887 . COSPAR: 2016-078D. Apogee: 537 km (333 mi). Perigee: 515 km (320 mi). Inclination: 35.00 deg. Cyclone Global Navigation Satellite System for NASA's Earth Science Division. The constellation of small satellites will investigate air-sea interactions that take place in the core of the storms..
CYGNSS B - . Payload: CYGFM02. Mass: 18 kg (39 lb). Nation: USA. Class: Earth. Type: Weather satellite. Spacecraft: CYGNSS. USAF Sat Cat: 41886 . COSPAR: 2016-078C. Apogee: 537 km (333 mi). Perigee: 515 km (320 mi). Inclination: 35.00 deg. CYGNSS C - . Payload: CYGFM03. Mass: 18 kg (39 lb). Nation: USA. Class: Earth. Type: Weather satellite. Spacecraft: CYGNSS. USAF Sat Cat: 41891 . COSPAR: 2016-078H. Apogee: 537 km (333 mi). Perigee: 515 km (320 mi). Inclination: 35.00 deg. CYGNSS D - . Payload: CYGFM04. Mass: 18 kg (39 lb). Nation: USA. Class: Earth. Type: Weather satellite. Spacecraft: CYGNSS. USAF Sat Cat: 41885 . COSPAR: 2016-078B. Apogee: 537 km (333 mi). Perigee: 515 km (320 mi). Inclination: 35.00 deg. CYGNSS E - . Payload: CYGFM05. Mass: 18 kg (39 lb). Nation: USA. Class: Earth. Type: Weather satellite. Spacecraft: CYGNSS. USAF Sat Cat: 41884 . COSPAR: 2016-078A. Apogee: 537 km (333 mi). Perigee: 515 km (320 mi). Inclination: 35.00 deg. CYGNSS F - . Payload: CYGFM06. Mass: 18 kg (39 lb). Nation: USA. Class: Earth. Type: Weather satellite. Spacecraft: CYGNSS. USAF Sat Cat: 41889 . COSPAR: 2016-078F. Apogee: 537 km (333 mi). Perigee: 515 km (320 mi). Inclination: 35.00 deg. CYGNSS G - . Payload: CYGFM07. Mass: 18 kg (39 lb). Nation: USA. Class: Earth. Type: Weather satellite. Spacecraft: CYGNSS. USAF Sat Cat: 41890 . COSPAR: 2016-078G. Apogee: 537 km (333 mi). Perigee: 515 km (320 mi). Inclination: 35.00 deg. CYGNSS H - . Payload: CYGFM08. Mass: 18 kg (39 lb). Nation: USA. Class: Earth. Type: Weather satellite. Spacecraft: CYGNSS. USAF Sat Cat: 41888 . COSPAR: 2016-078E. Apogee: 537 km (333 mi). Perigee: 515 km (320 mi). Inclination: 35.00 deg. 2017 May 30 - . 19:28 GMT - . Launch Site: Vandenberg. Launch Complex: Vandenberg LF23. LV Family: Pegasus. Launch Vehicle: GBI. FTG-15 - . Nation: USA. Type: ABM. Apogee: 500 km (310 mi). Interceptor. FTG-15 intercept..